Reza Aslan was just another religious scholar that published a book “Zealot: The Life and Times of Jesus of Nazareth”. Reza Aslan as matter of fact also happens to be a Muslim, Fox news on the other hand just can’t put both together. The result? Well an awkward confrontation. The bizarre interview in Fox news where Reza Aslan was trying to put some sense into the interviewer who kept just couldn’t understand why should a Muslim be interested in Jesus. Reza Aslan played the interview quite good, though the interview was nothing about his book, looks like Fox news wasn’t interested in his book at all in the first place. It just tried to frame him ‘bad’ by using the notation a Muslim trying to defame Jesus. 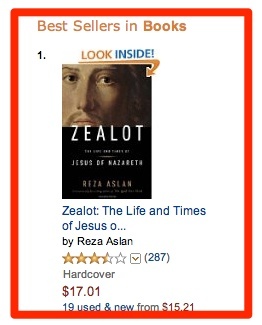 While Fox News still doesn’t understand what all the controversy is about, Reza Aslan hit No.1 spot on Amazon for his book Zealot: The Life and Times of Jesus of Nazareth. “You’re a Muslim, so why did you write a book about the founder of Christianity?” Fox News’ Lauren Green demanded of religious scholar Reza Aslan, author of “Zealot: The Life and Times of Jesus of Nazareth,” on Friday. So, while Fox news tries to find whats the fuzz about and why all the questions, whats your take on this interview? UFO sight in UK: Truth or Trick?? ?